For the second consecutive year, Lower School student Eesha ’28 earned recognition for her ideas to combat global warming. This year she has proposed a fish-looking drone to reduce marine pollution. Anisha (a rising USN kindergartner at now Primrose School of Hendersonville), and her friend Mithra (a third grade student at Nannie Berry Elementary School) with a laptop and awards for their work on a global warming research project. Eesha and Mithra worked on the science project as part of the ExploraVision contest sponsored by Toshiba. They proposed the creation of a solar-powered, GPS-operated fish drone that would ingest plastic polluting oceans and convert the waste into biodegradable products. Third Grade Teacher Barbara Voehler sponsored their contest entry. 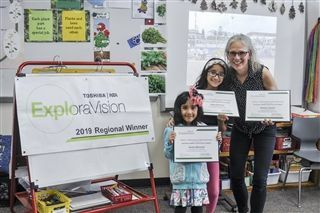 Out of thousands of entries, Toshiba named them regional winners, and they head to the national competition. In 2018, Eesha and Mithra proposed a genetically-engineered chlorophyll cell could negate the effects of carbon dioxide. They donated their prize laptop to USN, and it was shared with a High School student in need. Congratulations to these budding engineers and scientists. Rising USN kindergartener Anisha, sister Eesha ’28, and Third Grade Teacher Barbara Voehler, who sponsored their entry.